News of Brian Michael Bendis signing an exclusive contract with DC had me thinking about Ultimate Spider-Man, arguably the best thing he’s ever written. The voice of the series is singular and unique, and the consistency of Peter Parker’s characterization and writing makes him a lot more like Jack Knight than the original Spider-Man. As part of a separate continuity (which I would explain to a layman as ‘Like how the movies aren’t the same as the comics’) known as the Ultimate Universe, it’s also incredibly accessible to new readers. 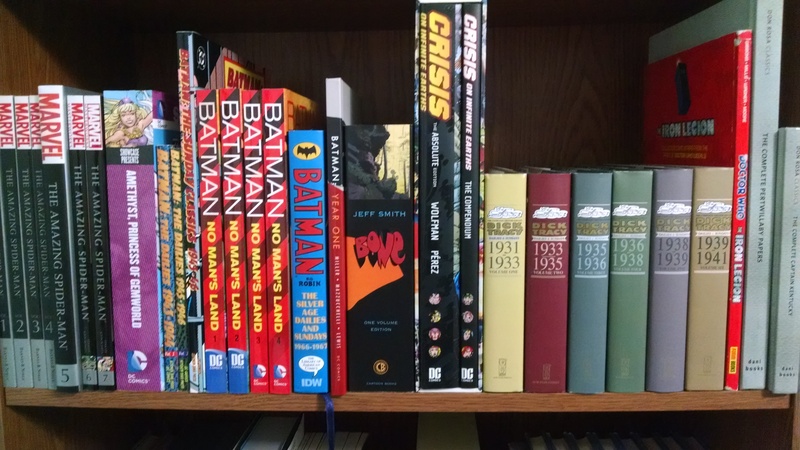 So when I was at a used book store talking to a guy who wanted to start reading comics, I recommended a copy of Volume 1 – Power and Responsibility without hesitation. There are eight Volume 1s of Ultimate Spider-Man. 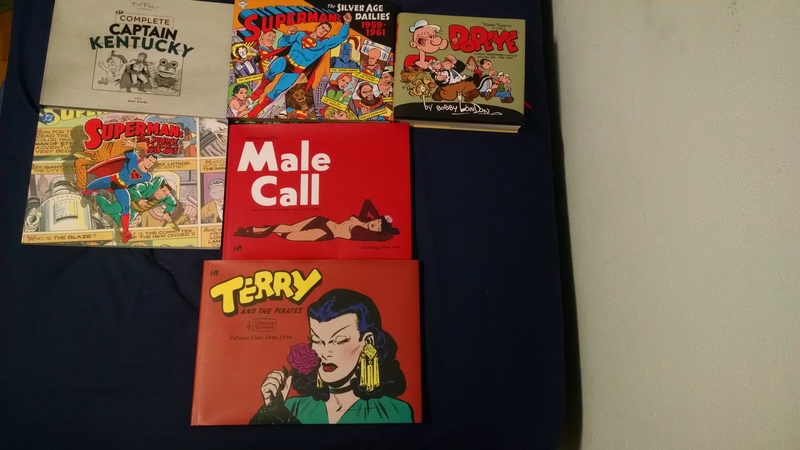 Comics have been a part of my life since I was young. I learned the proper way to read a Silver Age comic book (soap, hot water, dry your hands, find a clean space, don’t bend the cover back, dog-ear nothing, the grading system works like this and I only want you handling Fine Minus or less, and here’s how we keep reversible tape from getting on the cover…), I learned how to follow an ongoing plot from “Sonic the Hedgehog”, I learned what the concept of sarcasm was from “Garfield”, and that’s all before the age of eight. The 90s weren’t a kind time for comics aimed at kids, at least not with the superhero material I liked to read. 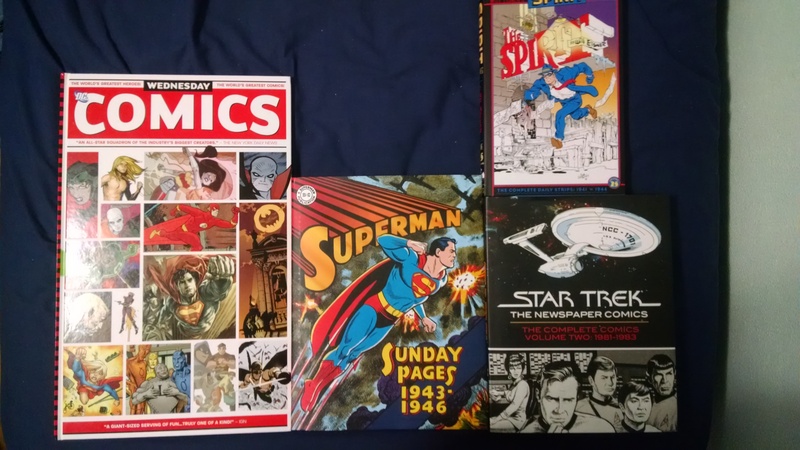 I busied myself with the DC and Marvel’s animated projects, anime, and my passion for television, but comics were always important to me. Discovering “Calvin and Hobbes” from trade paperbacks at a relative’s house was like drinking clean water for the first time. 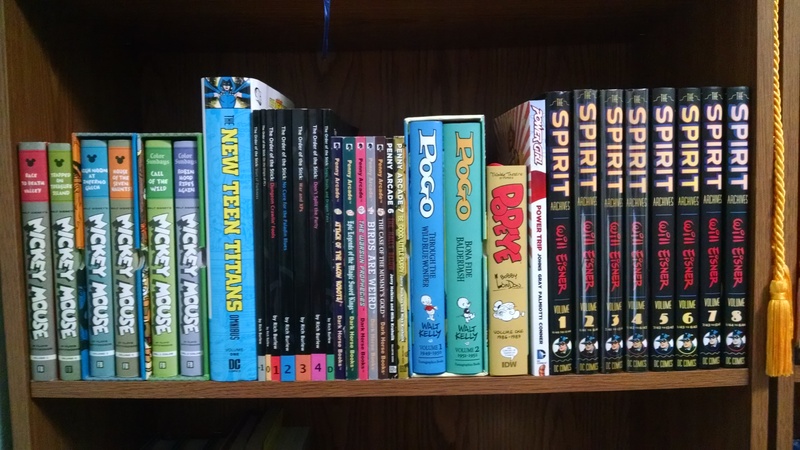 But getting back in to comics over the last five years has been a godsend for me as a reader and a person, and a big part of why I’ve been able to do that is thanks to being pushed towards Disney comics. The stories and artists that I enjoyed most from Disney were collected in trade paperbacks, which were easier to find than scouring garage sales, conventions, eBay and Craigslist for back issues (though I do that too: I’m looking at you, Gladstone’s Disney comics. See you at FallCon!) When reading the forwards/making of sections, I could see the where the influence of specific writers and artists that I admired came from, and in turn, who they influenced. Add to that my own love for superheroes, an impulse purchase or two, and the recommendations of friends, my collection grew from a Christmas present of “Batman: Year One” and a few “Knights of the Dinner Table” trades (not pictured, as the now 50+ volume collection is current stored in a box), to something that has my shelves bending from the weight. I’ve had more fun going back in to comics than I have with… well, just about anything I’ve done the past few years. 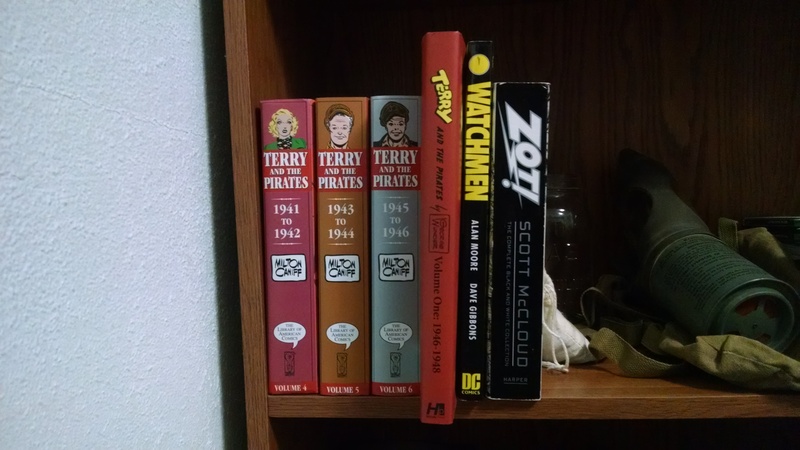 Naturally, this doesn’t properly represent the size of the books in question, as they’ve been pushed flush with the edge of the shelf for this post. 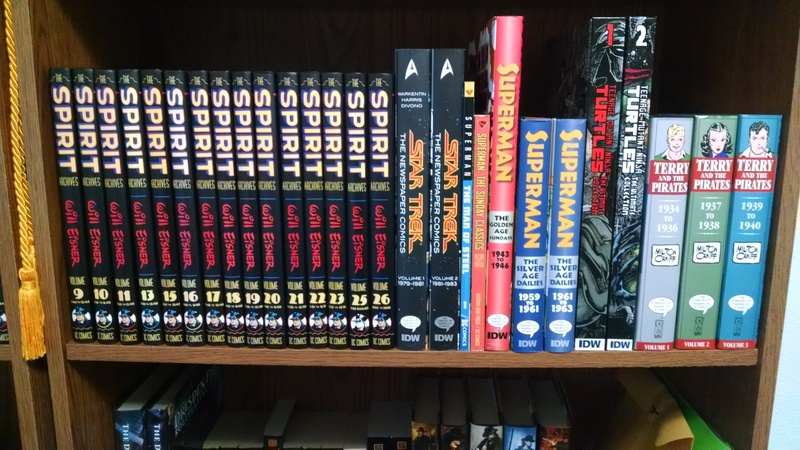 The oversized editions of comic books, which you can see with the Absolute Edition of “Crisis on Infinite Earths” up above, are generally what I shoot for when I shop. They tend to have the most bonus materials, and allow you to see the detail of the art much more clearly – especially with someone as wonderful as Perez. Incidentally, if you ever need a pick-me up, try and explain the plot to Crisis on Infinite Earths in depth to someone who has never read comics. Just watch their expression and you’ll get a real clear picture about why DC and Marvel have trouble finding new readers… and a good laugh in the process. But this brings me to a less rhetorical question. 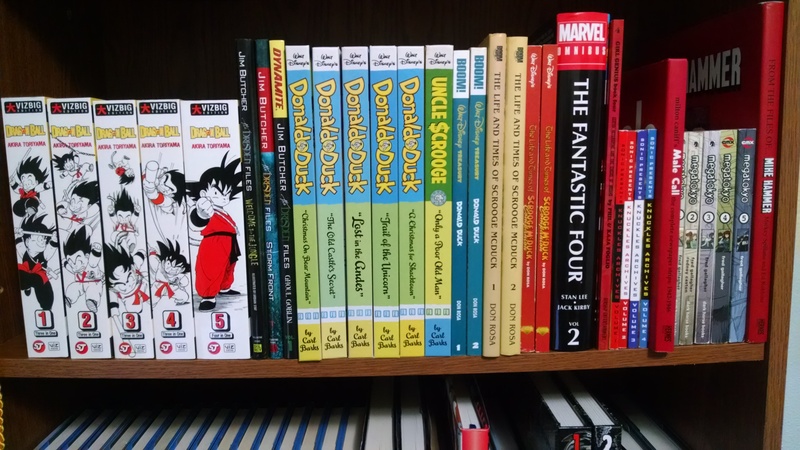 I have waited for the Fantagraphics Don Rosa box set before I continue Don Rosa in Review, so things have stalled a bit on that front until its publication. So looking at this collection, do you have a particular thought as to what I should take a look at in the meantime? Kindly leave a comment and let me know, and I’ll make that a priority. And of course, any suggestions as to comics I should pick up are GREATLY appreciated! I know no matter how many comics I read, there will always be more to enjoy, but that’s half the fun.